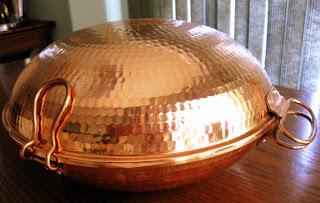 A Cataplana is a Portuguese cooking vessel that is traditionally made of copper and is shaped like two domed clam shells hinged at one end. It is designed to seal tightly so that the food cooks evenly and quickly. I received my Cataplana as gift from my father a few years back. 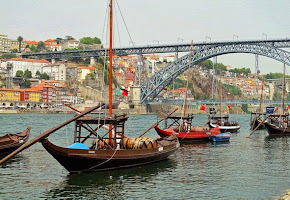 He had brought it back from his most recent trip to Portugal. I literally squealed with delight when I saw it. I remembered all the delicious seafood dishes I had tried that were prepared in one and I couldn't wait to make some of my own. 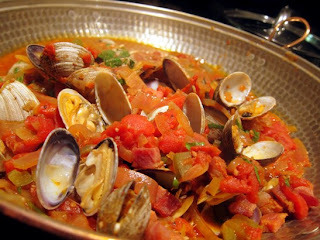 This is my favourite dish to make in my Cataplana.The saltiness of the pancetta and chourico compliments the clams and tomatoes perfectly. A real winner! As the cataplana sits on the stove top, it shakes and moves around a little. I think it's quite entertaining to watch and I'm sure your guests will think so too. :) Enjoy! 1. Over medium high heat in a large skillet, heat the oil, then add the pancetta and chourico. Fry until crispy. Remove the pancetta and chourico then transfer them to a paper towel lined plate to drain. 2. To the oil, add onions, green peppers, bay leaves, paprika and piri piri peppers and saute until the vegetables are tender but not too soft, about 5 minutes. 3. Add the garlic and saute for another minute. 4. 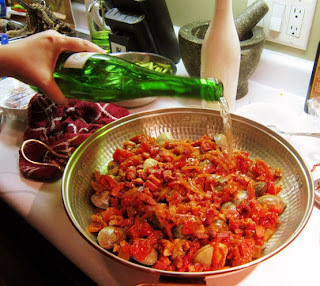 Add the tomatoes with their juice and 1/2 the vinho verde. 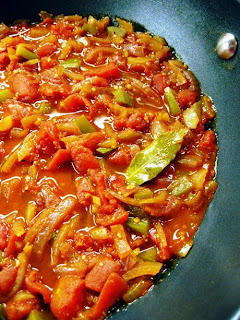 Reduce the heat to a low simmer and cook for about 45 minutes. Salt and pepper to taste but remember that the pancetta and chourico will also add to the saltiness of the dish so go easy on the salt. 5. To assemble the cataplana, spoon half of the tomato mixture into the bottom of the cataplana (if you don't have a cataplana just use a large dutch oven). 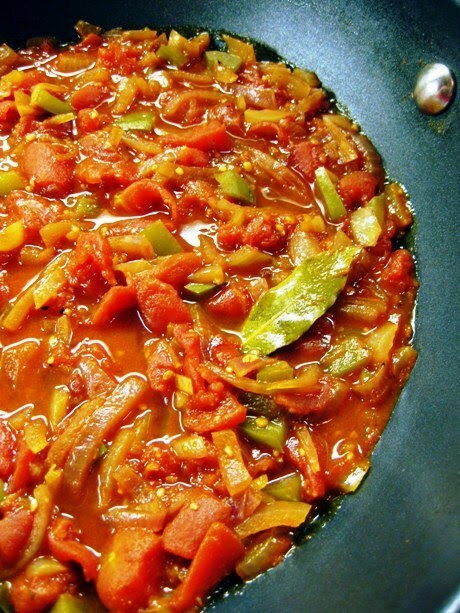 Bring the tomato mixture to a simmer in the cataplana. 6. Add the clams evenly over the tomato mixture then top with the remaining sauce. Add the rest ove the vinho verde and sprinkle 1/2 of the chopped parsley. 7. 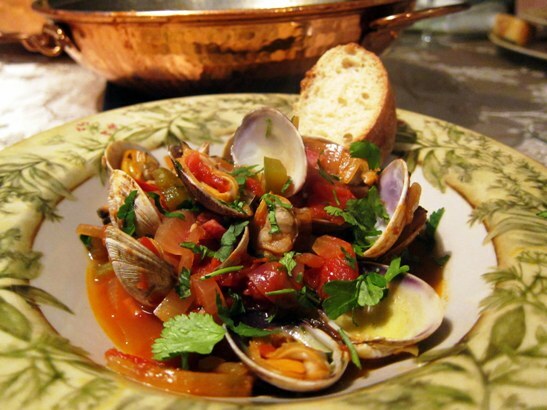 Close the cataplana tightly and let it cook until the the clams open up, about 10 minutes. 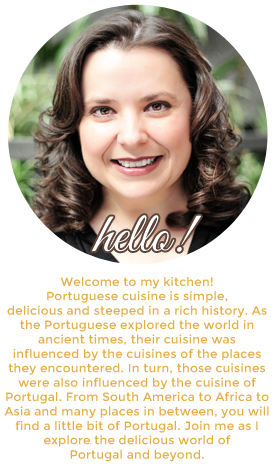 Remember that cataplana will move around a little on the stove top so keep an eye on it. Shake the cataplana occasionally. 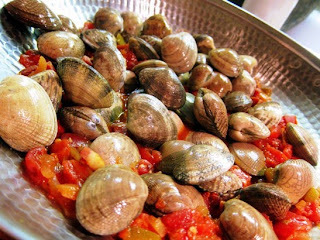 Discard any of the clams that haven't opened and stir in the reserved pancetta and chourico cubes. 8. I like to serve the clams right from the cataplana in the middle of the table. Sprinkle the top of the dish with the remaining chopped parsley and drizzle a little olive oil over it. Serve with crusty bread to sop up all the juices.